Let me know if you’ve heard this one already. OK, you probably have heard it before. But it likely still made you stop. Why? Because laughter can not only boost engagement, but it can spur analytical thinking. Tim is also no stranger to CMWorld. He has spoken in Cleveland and has generously shared his experiences with attendees. These two CMI posts provide key takeaways from his sessions. Read on to discover some awesome insights our participants shared during the chat. And check out our Twitter Moment to view more tweets from the discussion. PS, I tossed in a joke in at the end of this post. I hope it makes you smile. Comedy is largely subjective. So how can you define what your audience will find funny? What if you don’t consider yourself a funny person? Are there ways to develop your ability to create like a comedian? A4: I’ve known comedians to carry notebooks & write down ideas as they happen while observing & living life. Have you found success using humor in your work? Let us know in the comments below. Oh, and here’s the joke I couldn’t resist telling. 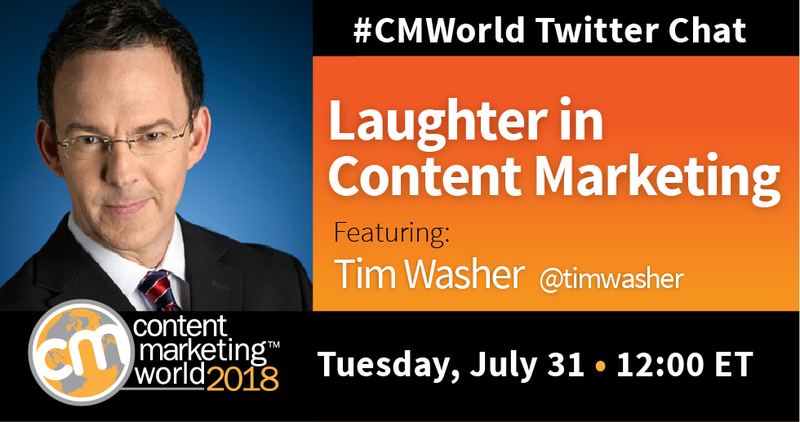 Catch our #CMWorld Twitter chat every Tuesday, when we bring together smart content marketers from around the globe. Have a topic suggestion? Know someone who would make a terrific guest? Tweet me at @MoninaW.